PanARMENIAN.Net - Who stands the best chance at survival in "Game of Thrones" Season 8? Plenty of fans have guessed and speculated, but a pair of Australian scientists set out to solve the question once and for all, Inverse reports. 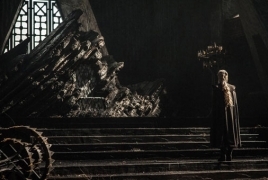 After rewatching all seven seasons of GoT (for science, of course), Macquarie University’s Reidar P. Lystad, Ph.D., and Benjamin T. Brown published their results, revealing several key characteristics that make any character more or less likely to die. - Be treacherous (the research shows that characters who “switched allegiance” are more likely to survive). It doesn’t include any specific predictions over who will actually survive Season 8, but in an email interview, Lystad said who he thinks is most likely to claim the Iron Throne. Lystad adds that if you ignore gender, which “had a relatively small effect size,” the list could also include Tyrion and Jon Snow. Tyrion clearly switched allegiances when he fled Kings Landing (and his family) to join up with Daenerys Targaryen. However, Jon Snow’s decision to join the Night’s Watch also qualifies him as a traitor based on the study, which simply requires that a character move from one House (or an organization like the Watch) to another.